Our fans are always asking me why I keep choosing Creativ Festival as one of the only places where The Crochet Crowd comes out to play. It’s simply due to location and the amount of people that show up. Attending shows are extremely costly and though we would love to attend more… we simply cannot afford it. We take the show extremely seriously as brings out 10’s of thousands of guests who will walk past us during the 2 or 3 day show. It’s held every April and October. It’s an opportunity to showcase creativity to people who think crochet is just for old ladies in rocking chairs, complete with kitty cats on their lap. The Crochet Crowd defies the stereotype and I am pretty proud of that. 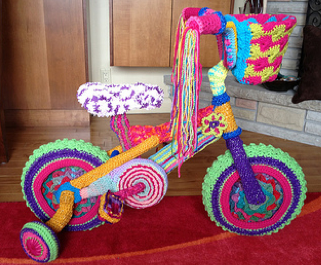 Mikey preparing to yarn bomb his bike. He was taking notes and writing down dimensions to aim for. Each show has 6 months of planning and inspiration being created for the show. The show is well attended by many returning guests. If we keep showing up to the show with the exact same inspiration and ideas, we will get labelled as ‘seen that before’ and that’s our biggest fear. We want to inspire and have guests excited to see what has been created just for the show. Creativ Festival pushes Daniel, Colleen and I plus 100’s of crochet crowders who like to get involved, to going above and beyond. It forces us to think outside of the box but more importantly, gets us to expand our skills and create things that our out of the ordinary. We have learned with Creativ Festival, the best way to connect with people is to showcase a theme each show. A theme that is identifiable that may cause feelings of nostalgia. It actually brings the ‘kid’ out in ourselves. As adults, we are pushed to be practical and to leave our imaginations in our youth times. Our goal is to bring back those suppressed feelings and give people the permission to be extremely creative. While at Creativ Festival, I have the opportunity to teach workshops, perform informal demos and most importantly, connect with yarn enthusiasts. I’ve lost count how many times a fan has been winded in meeting me in person. Some even hyperventilate. It’s an honour that people think so highly of me, but when the camera lights go off and I am removed from the public eye… I’m just like everyone else. I’m just crazy over yarn and the creativity involved in it. A washroom break for me takes a half hour. I am stopped constantly on the way by enthusiastic fans and I do love to chat. By the time I get to washroom, I am squealing with pain dying to go! I have to learn as soon as I get the urge… run and take the back routes. I have also learned never to scream out free yarn either! That’s a flash mob trample waiting to happen. Six months of planning is worth it. The weeks before the show is so stressful that you cannot imagine what it’s like to live with Diva Dan and I. We are both flying by the seat of our pants, while trying to keep the online world engaged. It’s craziness. My heart is at Creativ Festival. Rita Gramsch, owner of Creativ Festival, seen with her granddaughter Marisa, is one of my biggest supporters. She saw vision in my dream for The Crochet Crowd when we were only 5 Million Views old. Now, we are at 66 Million. Talking to Rita always brings me such joy as she is objective, thoughtful and knowledgeable about the industry. This Creativ Festival, April 2014 is going to be our 8th Show. We are bringing ‘Alice Hooks in Wonderland’ alive. We are creating a mini park. Our fans were charged with the inspiration of a top hat and to customize it to match an element of Alice In Wonderland story. I ‘m dying to show you a preview, but that would ruin the surprise. We know that our fans have really pushed themselves in every creative sense. Each hat deserves to win. The hats are going to be sold at the Creativ Festival after 2pm on Saturday, April 26th, 2014. You can bid on a hat. 100% of the proceeds will be put into a Scholarship Fund created by The Crochet Crowd. We are going to award Scholarships in the fall of 2014 at Creativ Festival. The top 5 winning hats will be kept and put on display for an special exhibit at Creativ Festival again in the fall. As an advanced thank you to everyone who has submitted a hat. We will be releasing pictures of all submissions on April 20th, 2014 online. The entire Top Hat Garden with all submissions will be on display at Creativ Festival on April 25 – 26, 2014. To not ruin our display, all hat sales will happen after 2pm on the final day at Creativ Festival. This entry was posted in Crafting Shows and tagged April, Creativ Festival, crochet crowd, Display, Mikey, October, Show. Bookmark the permalink. 16 Responses to The Point of Appearing at Creativ Festival? come to New Mexico! Albuquerque or las cruses! It’s all about hooking, don’t get it twisted. hi Kate im a crochet crowder in Scotland too where are you? My daughter and I are making a weekend of it. So very excited! I’ m honored to be part of The Crochet Crowd. You are such an inspiration. Thanks to all of you for all the inspiration and time you dedicate to all of us, The Crochet Crowders!!! So exciting! Love your enthusiasm expressed in this article! Makes me want to tell my boss: “see you after Creative Festival!” Unfortunately, that is like Alice’s dream world; not REALLY going to happen…LOL! I’m just going to enjoy the photo’s & dream of a future visit. Thanks to you, Daniel, Colleen & Cathy for all you do! I totally wish this were close to me so I could attend. I would totally bring you some food and water, Mikey! I see the date but where is this being held? Mikey lives in Ontario and I’m pretty sure that’s where the Festival is — or relatively close by. Never been there but would love to have one in the DC area!!! Its 3 hours from my home. It’s pretty local. Living in the country… 3 hours isn’t really that far. I am so proud of you all! It takes a lot of courage and planning to attend such a large scale festival (my past career taught me that) and you still do all those tutorials and blog and of course, hook! I have become more and more motivated to increase my skills by your enthusiasm. When I started hooking, I never thought I would see so many advantages in my life. It has helped me focus, stretch my mind and improved my manual dexterity. Thank you, from the bottom of my heart, for being such a great mentor! Would love to have one of those shows here in Fort Lauderdale, Florida.